Both John Tydeman and Gordon House made a short address to the assembled guests. John Tydeman spoke eloquently about the entries for the Imison Award, nearly all of which were for the 'Afternoon Play. For the Imison, there were 20 entries from the BBC and 8 from the independent sector. Both the winner and the runner-up for the Imison were from independents. Gordon House spoke of the very high standard of entries for the Tinniswood, and the pleasurable task of selecting the winner, upon which there was unanimous agreement. After the introductions, the Imison and Tinniswood Awards were presented by Rose Tremaine. I have summarised below the remarks she made before making the awards, and apologise in advance for any inadvertent errors. Rose explained why she is a radio drama lover - it's the 'economy of means' which she finds attractive. Her radio life goes back to the 1970s when she attended workshops given by Bill Ash and the late Martin Esslin, and she recalled a 'spoof' radio play written by Timothy West called 'The gun in my right hand is loaded', which was used as an illustration of how NOT to do it. Radio is a reflective medium, which is perhaps why novelists can write good radio drama. It is a shame that there are not more radio plays of greater length, and this might explain why established some playwrights shy away from writing them. Many stories need time for the plot to develop. It is to be regretted that the World Service is to lose its weekly drama slot as a result of BBC cuts. Fiction drama should have a place on World Service. In the words of Rose's mentor, Malcolm Bradbury, 'Imagination is the best pathway through troubled times', and being in the depths of recession, we are certainly in troubled times. Gordon House added some concluding remarks, including his concern for the cuts in radio drama, mentioning the loss of the Friday Play, Westway, Silver St. and the World Service plays. In his words, "Radio Drama is worth cherishing and fighting for". 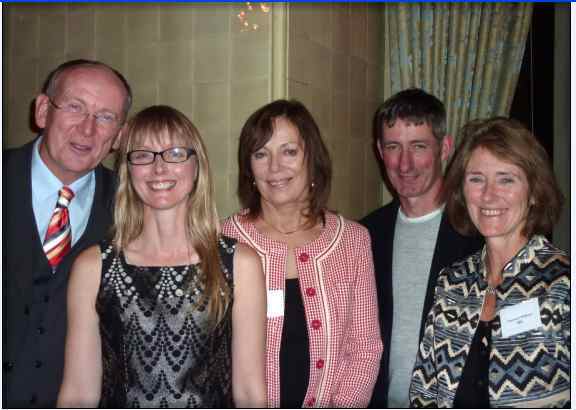 (l to r:) Gordon House, Hattie Naylor, Rose Tremain, Eoin McNamee, Gwyneth Williams. The prize of £1,500 is donated by the Peggy Ramsay Foundation. It is judged by members of the Society of Authors’ Broadcasting Committee (David Docherty (Chair), Mike Bartlett, Nazrin Choudhury, Alison Joseph, Nell Leyshon, Karen Liebreich, Sue Limb, Karl Sabbagh, Colin Teevan and Nick Warburton). The Imison Award, and the related Tinniswood Award, will be presented by Rose Tremain, and will take place on the evening of Monday 4th October, at a private reception at the National Liberal Club, London. 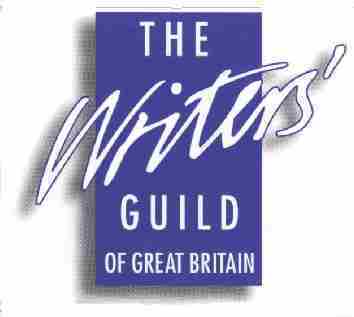 If you have a professional interest in the awards or shortlisted plays and would like to attend the reception, or for further information, please contact Anne Hogben at the Writers’ Guild. By Erin Browne. This play has already won a prize in the BBC World Service and British Council International Radio Playwriting Competition 2009 for English as a first language. For more information about this competition, see www.britishcouncil.org/arts-radio-play.htm. Erin Browne’s play is a tender three-hander about co-dependency and moving on. Sisters Lena & Chels are getting by just fine, awaiting the arrival of Chels' baby. Then Lena falls in love with the girl in the bookshop. Directed by Marion Nancarrow, an all-American cast stars Melanie Bond (Quantum of Solace), Sarah Goldberg (A Prayer for Owen Meany, Radio 4) and Sasha Pick (The Road to Guantanamo). Twelve-thousand scripts were received in the 2009 competition, which awards two first prizes: for the best play with English as a first language and English as a second language. By Eoin McNamee. A truck driver in Ireland gives a lift to a female Asian hitchhiker but gets more than he bargained for; especially when his truck is stopped by immigration officers and he and his illegal occupant are taken in for questioning. Coyle ...... Stuart Graham, The Road Wife ...... Su-Lin Looi, Michelle ...... Alison McKenna, Sloan ...... Gerard McSorley, Natasha ...... Samantha Heaney, Jesus ...... Oliver Miceli, Lee ...... Logan Wong, McCall ...... Vincent Higgins, Bobby ...... Peter Ballance, Huttenlocher ...... Peter Jankowsky, Nigerian Child ...... Loretta Adenuga. Directed by Heather Larmour. Broadcast: 23 Mar 2009 14:15 BBC Radio 4 . J. Parkes' magical story of love, death and redemption, recorded on location in Hackney. Four inner-city children discover the beauty of life when they become strangely involved with a dying woman. Broadcast Sat 3 Oct 200921:00, BBC Radio 3. By Deborah Wain. Neglected and secretly pregnant; 15-year-old foster child Ellie looks for love in the wrong place until it finds her with a power she never expected. Ellie ...... Jemima Foxtrot, Gavin ...... Neil Dudgeon, Sharon ...... Deborah McAndrew, Jeremy ...... Darragh Mortell. Directed by Nadia Molinari. Broadcast Wed 6 May 2009 14:15 BBC Radio 4 (FM only). Please download entry forms from the SOCIETY OF AUTHORS website. Submissions deadline: 5 February 2010. The Imison Award - £1,500 to the writer from the Peggy Ramsay Foundation and a digital radio from Pure Digital. Encourages new talent by rewarding the best original radio drama by a writer new to radio and transmitted in the UK during 1 January - 31 December 2009. The work must be the first dramatic work by the writer (or writers) that has been broadcast. It may also include the first episode from an original series or serial. An adaptation for radio of a piece originally written for another medium and published/broadcast/performed will not be eligible. The award is judged by the Broadcasting Committee of the Society of Authors. Submissions will be accepted from any party. · a supporting statement, a 250 word synopsis and 250 word author biography (Please email these to sbaxter@societyofauthors.org). Entries will not be returned and should be sent to Sarah Baxter, The Society of Authors, 84 Drayton Gardens, London, SW10 9SB. Richard Imison was a BBC script editor, Deputy Head of the BBC Radio Drama department and the Managing Director's spokesman for Radio. His entire career was devoted to radio drama and developing new talent. He discovered dramatists such as Tom Stoppard, but also encouraged established writers such as Edward Albee, Ludmilla Petrushevskaya, Alexander Gelman, Harold Pinter and Samuel Beckett to write for the genre. He founded an International Commissioning Scheme and worked on steering committees for both the Prix Italia and the European Broadcasting Union. The Imison and Tinniswood awards are supported by The Society of Authors, The Writers’ Guild and the ALCS. Submissions and Eligibility - see below. Background information about the award and about Richard Imison is given at the bottom of the page. Submissions will be accepted from any party (production, broadcasting organisation, producer or independent production company, editor, writer, writer's agent, etc.). The submission must be accompanied by an entry form setting out the date and time of transmission, the broadcasting body concerned, who produced the piece, and a statement to the effect that the piece was the first radio drama to be broadcast by the writer or writers. Submissions for the award must consist of a completed nomination form as well as three copies of the writer's original script and recording of the broadcast. Further copies will be requested if the work is short-listed. Please email a 250 word synopsis and 250 word author biography to Jo McCrum. Entries will not be returned and should be sent to Jo McCrum, The Society of Authors, 84 Drayton Gardens, London SW10 9SB. Click to print an application form. Please note this is the old form; the 2010 version will probably be similar but is not yet available on the Society of Authors website. Go there to check! Submissions for the award must be received by 1 Jan 2010. Eligibility: Any radio drama first transmitted within the United Kingdom between 1st January and 31st December 2009 by a writer or writers new to radio. The work must be an original piece for radio, and it must be the first dramatic work by the writer or writers that has been broadcast. It may also include the first episode from an original series or serial. An adaptation for radio of a piece originally written for stage, television or film is not eligible. Please check the Society of Authors website for the small print. Richard Imison was born in Birkenhead, Merseyside, 31 October 1936 and died of cancer 9 February 1993. Reading archaeology and anthropology at Pembroke College, Cambridge in the late 1950’s he formed and ran the Pembroke Players. Each vacation the players would tour Germany performing Shakespeare. On graduating he joined the BBC and apart from brief stints as the BBC’s representative in India and on the television archaeology series Chronicle his entire career was devoted to radio drama. As Script Editor, he headed a large script reading unit where he and his dedicated staff conscientiously sifted thousands of scripts each year to find the best 400 suitable for production. No talent was overlooked. He was always staunchly loyal to writers he especially admired, whatever anyone else may have thought. He had perhaps the greatest spread of influence of anyone working in the field, giving writers the most unstinting support. He not only discovered dramatists such as Tom Stoppard, but also encouraged established writers such as Pinter and Beckett to write for the genre. Through the BBC he founded an International Commissioning Scheme which commissioned acclaimed stage playwrights (Edward Albee was one) to write for radio. When the United States set out to revive Radio Drama in the 1970’s he advised the Corporation of Public Broadcasting and with the arrival of glasnost visited the Soviet Union to put together a Russian season with such writers as Ludmilla Petrushevskaya and Alexander Gelman. He also worked on steering committees for both the Prix Italia and the European Broadcasting Union. At home he was always a good friend to, and accessible point of contact for both the Writers’ Guild and the Society of Authors. He became Deputy Head of the BBC Radio Drama department and in his final year with the Corporation was appointed the Managing Director’s spokesman for Radio. In 1992, he decided to take early retirement to develop his talent for painting, writing and to finally produce a long-promised book sharing his knowledge and understanding of radio drama. Sadly, he never had time to complete it.